They were able to see the spiritual warfare that has surrounded them and understood that it was a battle that they needed to learn to fight as they advance in the Kingdom. It is a very important lesson that we all need to learn. As we seek a deeper relationship with God, the enemy comes against us more to kill, steal and destroy. The spiritual attacks increase, and we have to be prepared everyday to fight this battle for we do not fight against flesh and blood but against the dark rulers of evil. We have to put on the Armor of God everyday and fight the good fight while walking in faith as Children of God. 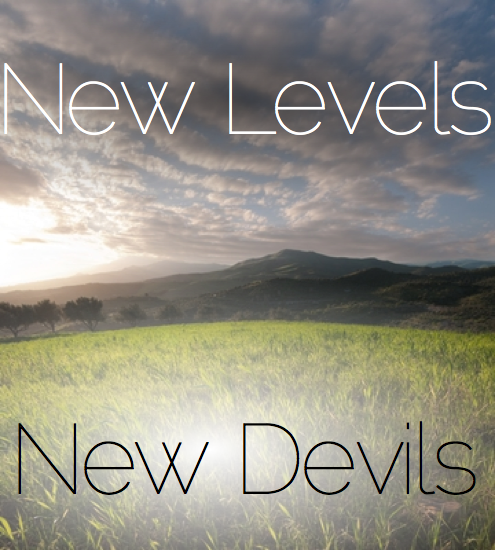 Yes, new levels means new devils and more warfare… But Christ has already overcome the world and He lives within us so there is nothing that we can’t overcome through Christ. We have to walk by faith, not by sight. Dear Lord, we thank You that You have equipped us to fight this battle and ask You to draw us into a deeper relationship with You. Protect us from harm. Guide our paths and orchestrate our lives. Bring healing and restoration to our lives. Help us to walk in faith, not by sight as we declare Your promises, Your Words to us, and walk in the fullness of blessings that you have in store for us… in Jesus’ amen. Amen.